Thanks to Tim Storey and his colleagues at the National Conference of State Legislatures, the Crystal Ball can share with you the most up-to-date picture of power control in the states. It is summed up nicely in the two maps and one graph, below. Republicans now control both legislative chambers in exactly half the states, the most since 1952 (when the total was also 25). 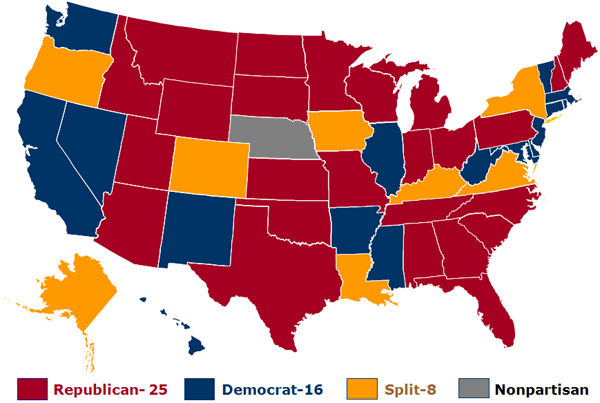 Democrats control both chambers in 16 states, and control of the two chambers is split in 8 states. Nebraska technically has a nonpartisan legislature, though in fact the GOP rules the roost there. Excluding Nebraska, there are 98 partisan chambers in the 50 states. Republicans are in charge in 57, Democrats in 39, and two are tied (Alaska Senate and Oregon House). Not surprisingly, in our complicated system of divided legislative and executive power, the map is muddled further once the governorships are added. The governor may be of a different party than one or both houses of the legislature, and he or she can veto actions of the legislature. Thus, Republicans fully control only 20 states, though this is up from a mere 8 prior to the 2010 election—and the total is 21 if you wish to include Nebraska. Democrats run the show in 11 states. 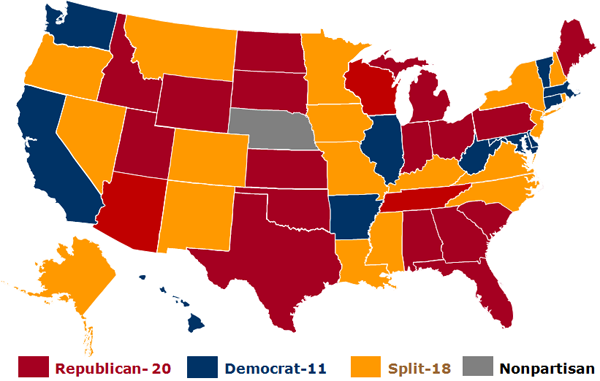 And in 18 states, there is some sort of split-party control. No one ever said it was easy to run a government in the USA. Looking again just at the state legislatures, there have been long stretches in the modern era when Democrats controlled between 60-70% of the total number of legislative berths in the 50 states. 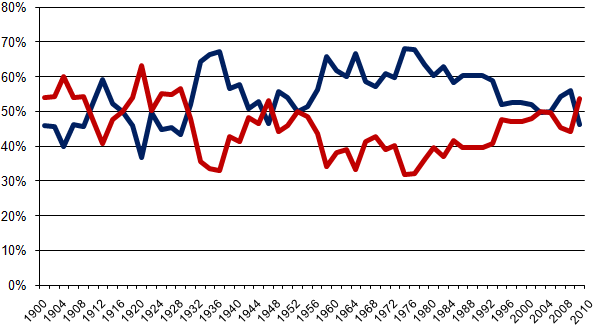 As of 2011, Republicans have surged into the lead, with 53.1% of the total—the GOP’s high point since 1928. Democrats now control 45.6%, with 1.3% nonpartisan, independent, or third-party.